We’ll be doing a couple of posts this year so be sure to look for the other posts throughout the season. I’m a big college football fan (Go Big Red, yes I’m a Cornhusker fan tried and true!) I love tailgating with anyone who knows how to do it right! My brother and his wife are really good at it! They have friends who have a motorhome and usually bring that at least once during the season to crank up the tv, the barbecue and a place to party before the big game. It’s also great because you end up hanging out long after the game is over to miss all the traffic. 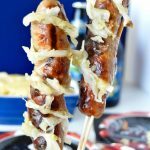 I really like this recipe for Grilled Sauerkraut stuffed brats because I don’t miss the bun at all. I love that I can enjoy my brat and have each bite still have the sauerkraut with each mouthful! 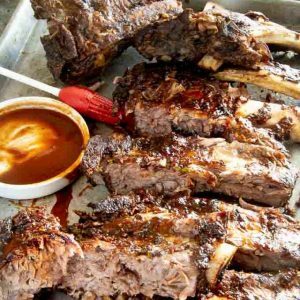 It’s so easy to do and since you can grill it right at the tailgate there is nothing to do ahead of time except make sure you have all the ingredients. Since there are only 5 things in them, its easy to get that part right! 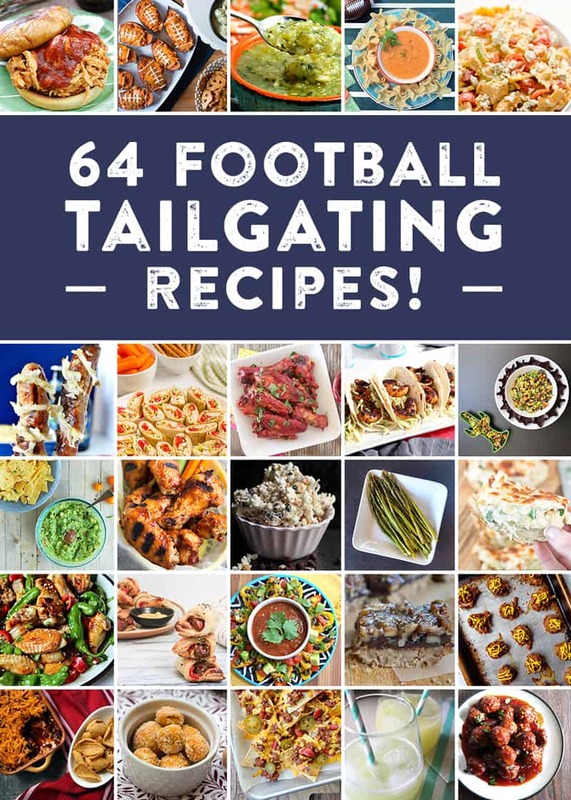 I live in Los Angeles and the whole city is pretty happy that the NFL is back so the team I’ll be making a lot of fun tailgating recipes for is the Rams! Look for a future recipe that might even be in their team colors. 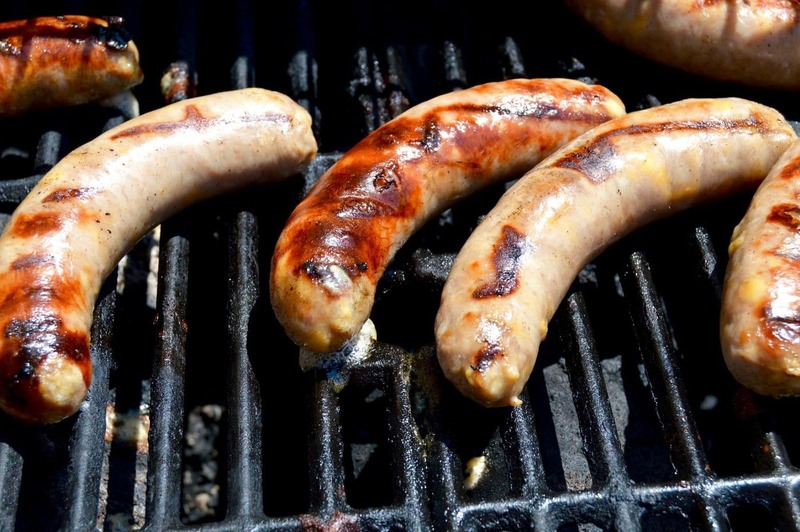 My biggest pet peeve with people who grill Brats is when you’re served one and its really dried out. By using the tip I share you will NEVER have this problem. Ready or not! Football season is here! Enjoy! 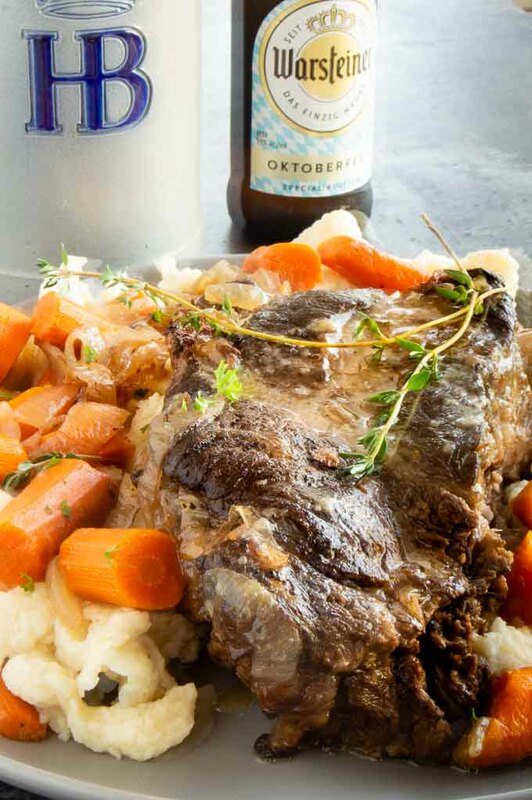 Homemade German Sauerbraten for Oktoberfest Parties! 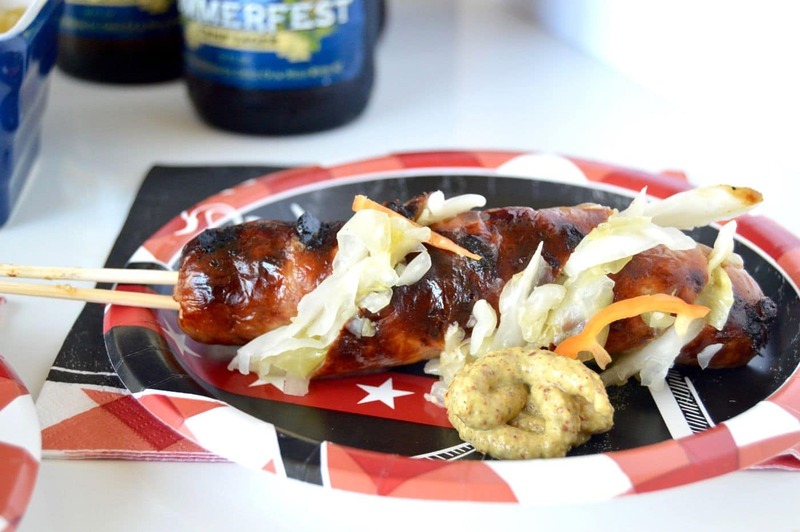 These Brats also go great for an Oktoberfest fest celebration! 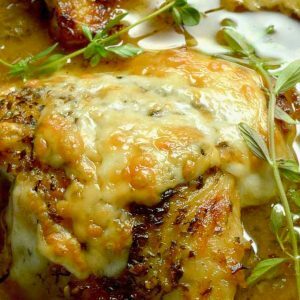 Check out these other recipes that you can use in your own party with these Oktoberfest Food ideas! Turn your grill on and heat to high. (When you place the brats on they should immediately sizzle. Char all sides, cooking for a total of 8-10 minutes, turning occasionally so that all sides brown. While brats are cooking, place grill safe pan (I use a skillet type pan) on one side of the grill to get hot. Toss sliced onions with olive oil and then place in the pan stirring often to heat and soften through. 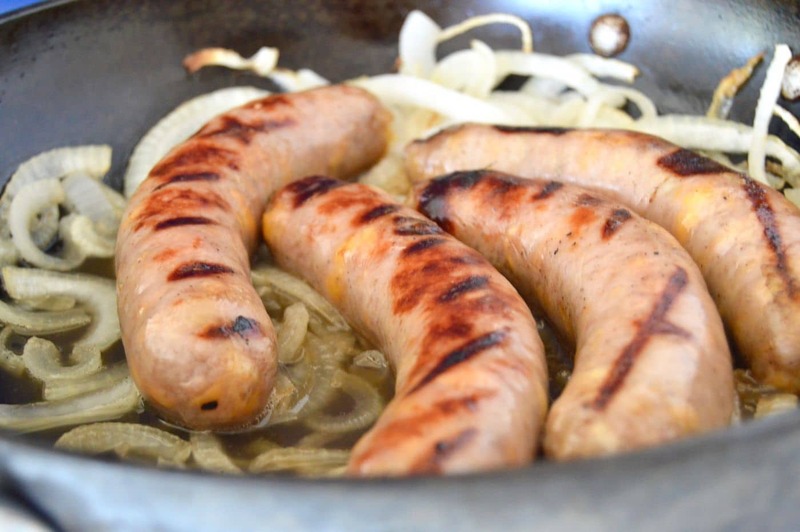 Once brats are browned, place brats on top of onions in pan, then pour beer over the top. Reduce heat to medium flame. Continue to cook brats for 15-20 minutes until cooked through out. Strain any beer (if any at all) and serve onions on the side for anyone who wants them. Place Sauerkraut in each slice. Serve with mustard and or ketchup for dipping. First off, sauerkraut — you are speaking my love language! 😉 . Then tailgating and football?? YES!! 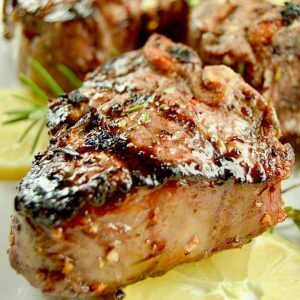 These will be showing up at our tailgate this fall, and on our grill this summer!! DROOLING!! oh and one more thing?? Love this! This was a hit at our first BBQ of the season!! I’m not a bun fan either…this is just brilliant! I love a good brat, and your beer finished brats sound great! 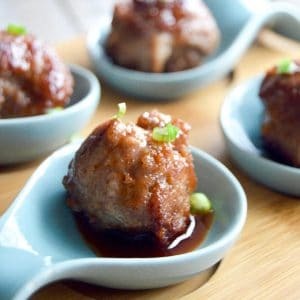 I’ve never thought to serve them on a stick when we BBQ, but that’s a fab idea for tailgating, or just for game watching! I also love sauerkraut on my brats! Win-win! What a unique recipe! You know what, I have never tried sauerkraut, but that needs to change and I need to make some of this! I used to abhore sauerkraut…. but ever since I tried them with bratwurst Im a convert! It adds a great crunch to each bite! Isn’t grill cooking the best in the late summer heat? I hope your husband enjoys them! So few ingredients! Love the round-up too! Brilliant list! Absolute genius, this is my new favorite way to do brats! I bet my husband would LOVE these. Great idea. Love the simplicity & flavor combo! I love a good beer brats! 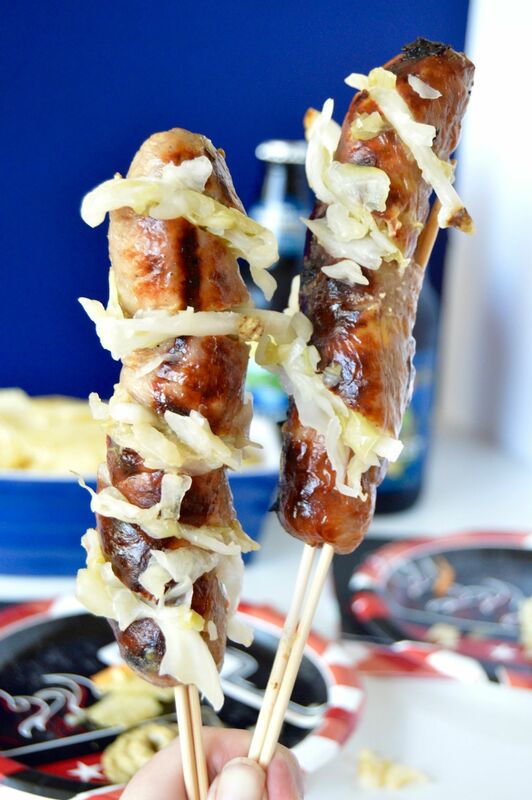 You are so clever to stuff the sauerkraut in the brats and meat on a stick is perfect for tailgating!